This is a nice little tent and fits two people easily along with some gear. I like the inside pocket for keeping small items like keys, phone, and other stuff that I want to be able to find as soon as I wake up. 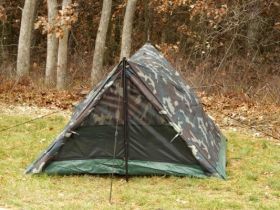 I've used this tent with me and my daughter on many outings and we are still using the same one. For an emergency shelter, this tent is over the top and is more than you need. If your home becomes unusable or you find yourself stranded somewhere, you really want a comfortable place to sleep. Especially for your family members who aren't accustomed to roughing it or camping outdoors, you want at least some sort or normalcy when forced to sleep outdoors. As a small, lightweight tent for camping, this is perfect. For an emergency shelter during a natural disaster or emergency, this does more than cover that base. Straps right underneath your backpack or fits in a small corner of your trunk, this shelter item is there when you need it. 2 Person Trail Tent - woodland camouflage, reinforced polyethylene floor, full zippered nylon front door with storm flaps, large mesh rear window, includes aluminum poles, stakes, ropes, stuffsack size: 78" x 54" x 36". WEIGHT: 4 LBS, 7 OZ.